37 jobs currently online. 219 resumes currently online. 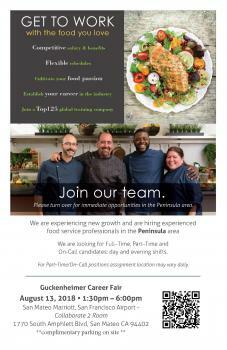 AUGUST 13, 2017 - 1:30 p.m. to 6:00 p.m.
We are hiring for the following foodservice positions in the Peninsula, South Bay areas. If you are unable to attend, please respond on your application with your availability. Join a TOP 125 Global Training Company. Visit our Website at www.guckenheimer.com and Facebook, Instagram page to learn more about Guckenheimer.